Please click images to view them full size. Saul Steinburg was an American artist during the 1900’s, renowned for his drawings that appeared in “The New Yorker” that spanned over six decades. Later in his life, he began to take brown paper bags and drew faces on them for him to conceal himself and even sometimes his friends in. 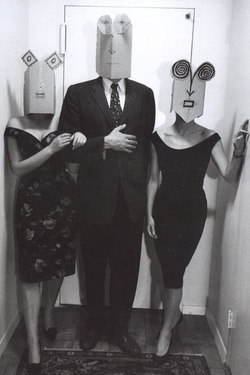 These characters were photographed by Inge Morath in a variety of settings, both indoor and out. 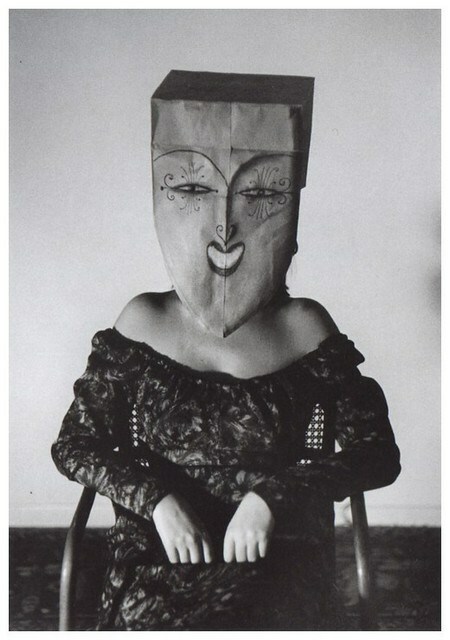 The theme of “Disguise” was prominent in Steinberg’s art, and even more so in the following photography. Inge Morath was an Australian photographer who lived from 1923 to 2002. She has worked with famous celebrities such as Marilyn Monroe and Clark Gable. In this particular Mask photo-shoot, the positioning and ideas came from Steinberg, through his various artworks which featured disguise. With Steinberg’s imagination, and Morath’s photographic skills, they produced a set of very interesting photographs. This particular photograph shows a slender woman sat comfortably in a wire chair against a white background. By the bone structer of the womans shoulders, we can see that she is likely to be a well proportioned, composed female - most likely with appealing features. However, this theory is contrasted by the paper bag concealing what we presume is a beautiful face. The drawing on the bag features a feminine face, however the makeup has been over exaggerated, with long curly lashes, deep eyeliner and heavy lipstick. Also, the face is very angular and symmetrical, giving the impression that Steinberg wanted to portray that too much effort in making ones self look beautiful can only end in a hideous outcome. This theory also fits in with my idea of disguise, as makeup "disguises" the flaws on someone, such as bad skin, and turns this into perfectly clear skin by layering a large amount of concealer on. In regards to the rest of this photograph, I like the use of having the subject against a white background. For example, if the background had been black, the subjects clothes and the chair would have looked lost against it. This second photograph features three subjects stood in a well-lit corridor. I particually like how the three people are positioned primarily in the centre of the image. This creates a feel of symmetry in the photograph, making it overall very balanced. I also like the height difference between the two women and the middle man, this draws the eye to his mask rather than the others. I believe Steinberg chose to have this photograph compositioned like this in order to make the man the main focus. One interpretation of this image could be that the masked man has money, and has hired the two women. Judging by the clothes used, one would presume they are heading to a formal meeting. I personally prefer the first photograph to this one, however I like the fact that this image uses the rule of thirds, and symmetry. Whereas the first only makes use of symmetry. This makes the photograph more appealing to the eye. Also, the man in tihs photograph is framed by the doorframe behind him, once again I believe Steinberg did this on purpose. In conclusion, although I like Steinburg and Moraths mask series, I personally feel that the images don't look proffessional enough. And can sometimes seem cluttered - such as the rug and tiling on the floor in this photograph, it's pointless and draws the eye away from the main focus. I much prefer masks to be used in a glamourous situation, rather than just for casual fun.